PRICE REDUCED! TURN KEY FULLY FURNISHED LakeFront home on Pine Hollow Reservoir. 1850 sq.ft. 3 bedroom/2 bath home. Lg. open floor plan. Comfortable living area with built-in entertainment ctr.& rock gas fireplace. Lg. kitchen with stainless steel appliances. Energy effecient Trane Heatpump. Lg. covered deck with outdoor heaters. Play structure. Firepit. Storage sheds. Lg. lawn area w/underground irrigation. Ample parking space. Very large waterfront lot secured with a cement bulk head. Large private floating dock for easy boat tie up, swimming & fishing. Lake is routinely stocked heavily for incredible year round fishing. 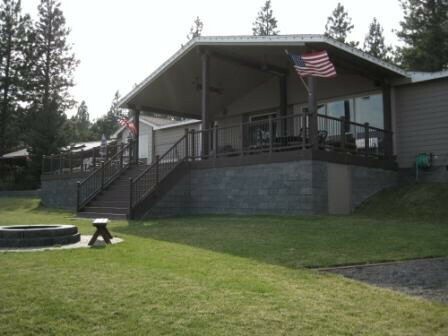 Minutes away from The Deschutes River and several other plentiful rivers & lakes. Wonderful Vacation/Primary Home or Income producing Vacation Rental. Additional pictures available. Motivated Seller!